Japan launched a next-generation geostationary weather satellite Tuesday on the 25th flight of the country's H-2A rocket, deploying an upgraded meteorological observatory critical to the minute-by-minute tracking of tropical cyclones and other storm systems across the Asia-Pacific. With its twin solid rocket boosters and hydrogen-burning main engine firing, the 315-ton H-2A launcher blasted off from the Tanegashima Space Center in southwestern Japan at 0516 GMT (1:16 a.m. EDT; 2:16 p.m. JST). The 174-foot-tall rocket, covered in orange insulating foam, pitched east from the picturesque island space base, passed the speed of sound in less than a minute, and accelerated into the upper atmosphere before releasing two empty 49-foot-long strap-on solid rocket motor casings to fall into the Pacific Ocean 28 miles below. The H-2A rocket's LE-7A main engine fired for more than six-and-a-half minutes, switching off at a velocity of nearly 12,000 mph to make way for the launcher's second stage LE-5B engine to guide the mission's satellite passenger -- the Himawari 8 weather observatory -- into orbit. The rocket's upper stage engine, also consuming super-cold hydrogen and oxygen propellants, ignited two times to reach an elliptical geostationary transfer orbit, a waypoint to the satellite's final operating position 22,300 miles over the equator. The Himawari 8 satellite -- weighing about 7,700 pounds at the time of liftoff -- deployed from the H-2A rocket's second stage about 28 minutes after the thunderous, smoky launch from Tanegashima. The rocket was aiming to drop the satellite into an orbit with a high point stretching 22,354 miles (35,976 kilometers) above Earth. The target orbit's perigee, or low point, was supposed to be at an altitude of 155 miles (250 kilometers) at an inclination angle of 22.4 degrees to the equator. 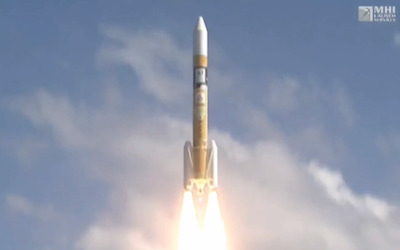 Mitsubishi Heavy Industries, the H-2A rocket's manufacturer and commercial operator, declared the launch successful. The satellite is the first of two new spacecraft built by Mitsubishi Electric Corp. for the Japan Meteorological Agency, or JMA. Himawari 8's onboard propulsion system will boost the craft into a circular orbit over the equator in the next few weeks, reaching an operational post at 140 degrees east longitude. The spacecraft carries a U.S.-built advanced imager that can scan the Eastern Hemisphere every 10 minutes, collecting near-realtime pictures of typhoons, cyclones, weather systems and clouds. Made in Indiana by Exelis Geospatial Systems, the weather sensor is the first in a new family of satellite imagers that can see storms in greater detail and with more rapid refresh rates. Similar weather instruments are scheduled to fly on NOAA's Geostationary Operational Environmental Satellite R, or GOES R, series of spacecraft when they begin launching aboard Atlas 5 rockets from Cape Canaveral in 2016. 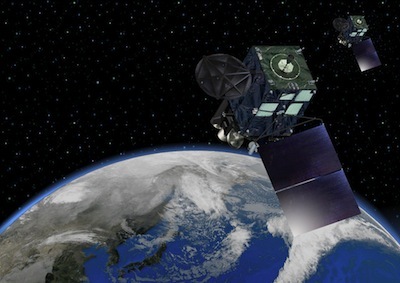 Artist's concept of the Himawari 8 satellite in orbit. Photo credit: Mitsubishi Electric Corp.
Himawari 8's main instrument is based on the Advanced Baseline Imager designed for NOAA's GOES R program. "We are all excited to get the ABI technology launched into space," said Eric Webster, vice president for weather systems for Exelis. "It will help Japan with improved forecasting and NOAA with ABI-class data for testing and use before GOES R launches in 2016. Japan has been hit by several large typhoons recently and ABI technology will provide significant improved capabilities for severe storm forecasting." The Advanced Himawari Imager on the satellite launched Tuesday can observe storms in 16 spectral bands -- up from five bands on the satellite it is replacing -- allowing forecasters to resolve greater detail on the structure and evolution of weather systems. The 16 bands -- three in visible wavelengths, three in near-infrared and 10 in infrared -- "enable better understanding of the Earth's cloud conditions," according to a fact sheet on the Himawari 8 mission released by JMA. Himawari 8 is set to replace the MTSAT 2 satellite launched in 2006, supplying weather data to forecasters in Japan, Australia, New Zealand, Southeast Asia and neighboring regions. Himawari 8 will take a full picture of East Asia and the Western Pacific every 10 minutes, an improvement over the half-hour update times available with Japan's previous weather satellites. The spacecraft's imager can take pictures of certain areas, such as all of Japan, at even faster refresh rates -- every 2.5 minutes. An identical satellite named Himawari 9 is set for launch on another H-2A rocket in 2016. Tuesday's launch marked the third flight of an H-2A rocket this year, following launches in February and May with the joint U.S.-Japanese Global Precipitation Measurement mission and the Advanced Land Observing Satellite 2. Japanese engineers are preparing another H-2A launcher for liftoff Nov. 30 with the Japan Aerospace Exploration Agency's Hayabusa 2 probe, kicking off a six-year roundtrip journey to return samples from an asteroid.